Take three friends. Add an old cookbook. Combine with cute boys and a pinch of magic…and see what kind of chaos ensues! 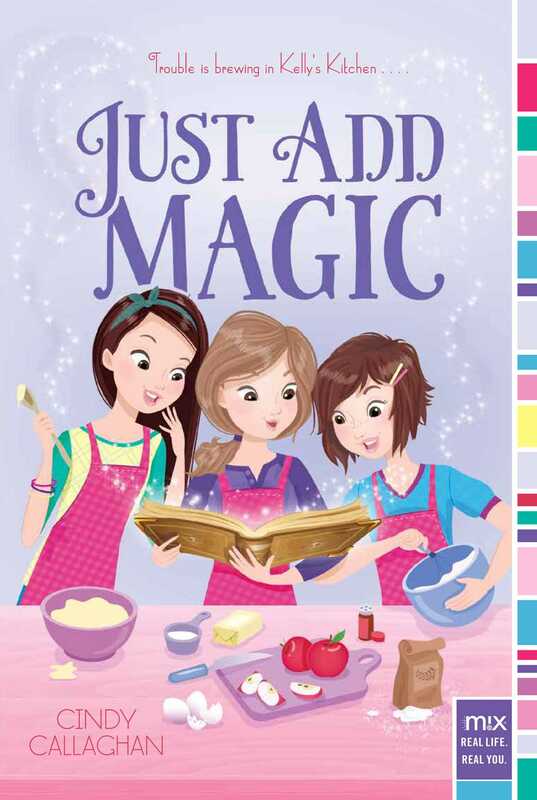 When Kelly Quinn and her two BFFs discover a dusty old cookbook while cleaning out the attic, the girls decide to try a few of the mysterious and supposedly magical recipes that are inside. To their surprise, the Keep ’Em Quiet Cobbler actually silences Kelly’s pesky little brother and the Hexberry Tart puts a curse on mean girl Charlotte. Is it possible that the recipes really are magic? Who wrote them and where did they come from? And most importantly of all, when boys get involved, what kind of trouble are the girls stirring up for themselves? hungry for cash with a cleaning project? spider-webby attic on their last day of summer vacation. Correction: I, Kelly Quinn, was cleaning. Darbie Rollerbladed in the clutter-free areas, careful not to bang her head on the rafters. I had missed Darbie this summer while she had been at her dad’s house at the beach and I had been at camp. “Are you okay?” I asked. “Fine.” Darbie sat among the piles of attic stuff, rubbing her head. “Where did all this junk-arooni come from?” she asked. “Some of it was my grandmother’s. And some belongs to the witch, Mrs. Silvers, from across the street. Her basement flooded years ago, and presto, we got her junk,” I said. “She says she doesn’t want any of it,” I said. Books are “blah” to Darbie. I don’t love them myself, unless it’s my journal or one of my cookbooks. Oh, BTW, I’m Kelly Quinn, age twelve, seventh-grader, lover of all things cooking, mediocre soccer player, average student, and best friend to Darbie O’Brien and Hannah Hernandez. I wasn’t thrilled to spend my last day of summer vacation cleaning the attic. However, I needed the money, and any time I could spend hanging with one of my BFFs couldn’t be all that bad. “Look, Kell,” Darbie said excitedly, dusting off a book. “It’s dated 1953.” For a book to capture Darbie’s attention, I figured it must’ve been something pretty interesting. It only took a second for me to realize there was no tamale, tomato, turnovers, or anything else starting with the letter T. In fact, the book wasn’t filled with anything encyclopedia-ish. The original pages were pasted over with yellowed stationery. The papers were thick, a little crunchy, and stained in places. The words on the stationery were handwritten, a little sloppy, and a few were in Spanish. I knew what I was looking at right away. I sat on the trunk and looked at each heavy page. The names of the recipes were very interesting: Forget-Me-Not Cupcakes, Love Bug Juice, and Tell Me the Truth Tea. And there were notes written all around the edges of the stationery, in the margins of the encyclopedia. “Darbie,” I said. “This isn’t an encyclopedia at all. It’s a bunch of recipes hidden in an encyclopedia. Do you know what that makes this?” I asked. “A recipedia!” Darbie said, grabbing some chunky pearls and bejeweled sunglasses from a hatbox as she Rollerbladed by. “That sounds perfect for a Food Network junkie like you.” She was right. I love to cook. Ever since my encounter with the famous TV chef Felice Foudini herself, I haven’t been able to get enough of cooking. My mom and I cook together all the time, and my other BFF, Hannah, gave me the very first book in my cookbook collection, which consists of six books ranging across the meal, dessert, and snack spectrums. They’re stored on a kitchen shelf with different colored Post-it notes sticking out from all sides. Just then, the latch on the attic door jiggled. It rattled hard like someone was trying to break in, which was strange because I would’ve preferred breaking out. Suddenly my sweaty mom, who had been cleaning out the garage, tumbled into the attic from pushing the door so hard. She stood at the top of the stairs with a red bandana covering her hair and ears, and yellow rubber dishwashing gloves covering her hands, looking like she’d just appeared on Extreme Makeover: Dork Edition. Thank goodness Hannah wasn’t here to see the outfit. She’s our local fashionista, particularly known for always color coordinating her headband, outfit, and socks. Mrs. Silvers is my older-than-dirt neighbor from across the street and she’s as nasty as a witch. She’s convinced that Rosey, our beagle, flies over, or tunnels under, our fenced-in backyard every day for the sole purpose of pooping in her yard. One day, when Rosey was a puppy, before we had the fence, she actually did poop in that yard and Mrs. Silvers saw her. Rosey hasn’t left our yard since. Still, thanks to that incident, I scoop for every dog on Coyote Street that uses Mrs. Silvers’s yard as their personal bathroom. While scooping didn’t thrill me, I was dying to get out of the hot attic to get some sunlight and fresh air. “Sure,” I said, and Mom vanished back down the stairs. “Unlike you, my mom hates bugs and spiders. She won’t touch them. When she cleans, she’s afraid they’ll land in her hair or crawl into her ears,” I explained. Darbie considered this. I could tell she was thinking about the bug thing. “Before you ask, no. You can’t stay and catch any. Besides, bats and rats hang out in attics, not bugs,” I told her. When our attic work was pretty much done, we headed across the street to Mrs. Silvers’s house. I walked, pooper-scooper in hand, while Darbie Rollerbladed. She blades pretty much everywhere. The crazy thing is that Darbie isn’t a great blader. She’s an okay blader who just manages to keep herself upright. (Of course, I don’t tell her that.) She stumbled to the driveway, to the sidewalk, to the street, to the grass. I held out my arm in case she needed it for balance. “What? The recipes?” Darbie asked. Mrs. Silvers yelled from her front porch, “If I see that mutt again, I’m going to call the pound!” She was surprisingly loud for a woman who looked old enough to be dead. Besides the flabby wrinkles that hung from a face covered in a perpetual scowl, her white hair made her recognizable from miles away. It was short and somehow able to defy gravity by sticking straight up in the air. It reminded me of one of those toy trolls that sits on top of a pencil. And while I assumed she had feet, we couldn’t see them under the weird muumuu/housedress thing she always wore. “Man, Silvers is a grouch-a-saurus,” Darbie said under her breath. “You would be too if you were a hundred years old and bent over all crooked,” I said. I didn’t actually know how old she was, but a hundred sounded about right. “Why do you have to scoop the poop?” Darbie asked. “Since Rosey’s mostly my dog, I have to be responsible for her.” I mimicked my dad on “responsible for her.” “And because, if I don’t, I won’t get my allowance, which I need to support my Swirley habit.” Darbie nodded understandingly. She and Hannah had the habit too. Super Swirleys were the best milkshakes in Delaware, and possibly the world. They’re ice cream and all kinds of other stuff blended into a heavenly frozen concoction. I can’t live without them. They were made at Sam’s Super iScream, which, luckily, was within walking distance from my house. After a refreshing breath of mid-Atlantic air, we headed back across the street and entered my house through the garage. We stopped in the kitchen for ice water. Our vegetable-themed kitchen was my favorite room in the house. The walls were painted artichoke green. Our plates were eggplant purple and stacked nicely in a tall glass-doored cabinet. The wallpaper border was a conga line of dancing carrots, cucumbers, bell peppers, radishes, and mushrooms, all with legs, holding pretty much every kitchen appliance, gadget, and accessory imaginable. Mom appeared, thankfully sans her protective gear. Her spider-free blond hair was flipped up in a clip. She’d changed into a clean LIFE IS GOOD shirt, gray cotton miniskirt, and cute sandals: undorked. “If I pretend Darbie isn’t wearing Rollerblades in my kitchen, will you girls load all the attic stuff into the minivan?” she asked. We kept quiet, not excited about loading. Silence. No sale, as my dad would say. “Oh, all right. After we drop off all the attic stuff at Goodwill, I’ll pay you for your work and treat you to Swirley’s.” We smiled. Darbie asked Mom, “Can we maybe meet Hannah-Hoobi-Haha at the pool after her laps?” Darbie loved to add a little jazz to Hannah’s name. SOLD to the lady with the minivan! Darbie switched to flip-flops and we loaded the van. I worked quickly because I was anxious to fill my belly with a Super Swirley and read the Secret Recipe Book. When we were done, I stuck the book in a canvas messenger bag that I wore across my chest. As luck would have it, my little brother, Buddy, tagged along. He was five going on annoying. The only thing good about having Buddy with us was that he couldn’t be rummaging through my bedroom and smearing his boogers on the wall. (Seriously, I actually caught him doing it.) Before we were even out of the driveway he was singing “The Wheels on the Bus” painfully loud. Darbie and I put our hands over our ears. As we drove off in the noise-polluted, air-conditioned van, I saw Mrs. Silvers looking out her living room window. 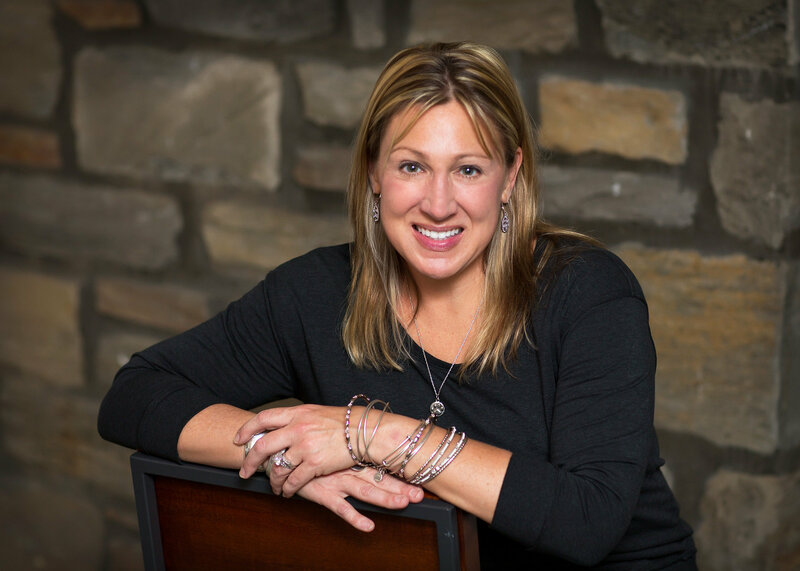 Cindy Callaghan is the author of the middle grade novels Lost in London, Lost in Paris, Lost in Rome, Lost in Ireland (formerly titled Lucky Me), Lost in Hollywood, the award-winning Sydney Mackenzie Knocks ’Em Dead, Just Add Magic (which is now a breakout streaming original series), and its sequel Potion Problems. She lives in Wilmington, Delaware.